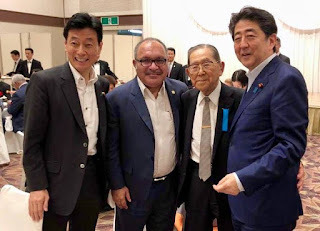 Papua New Guinea Prime Minister Peter O'Neill has paid tribute to Japanese World War II veteran, Mr Masai Horie, who works works to recover the remains of Japanese soldiers and bring them back to Japan. Mr Horie, who was Prisoner of War in Rabaul in 1945, is 103 years old, has traveled to Papua New Guinea 18 times and is a former Member of Parliament in Japan. “It was an honour to meet Mr Horie tonight,” PM O’Neill said. “His tireless efforts to bring his countrymen home is outstanding and has earned him the highest respect in both of our countries. "Papua New Guinea is the final resting place of so many courageous men and women from both sides of the war. “Our nation will always accord the highest respect to those still buried in our soil. “We will continue to work closely with Japan in their efforts to repatriate the remains of the fallen, and return them to their homeland." Image: Prime Minister O’Neill, Mr Horie and Prime Minister Shinzo Abe.